Get a taste of Italy's sunny Tuscany region with the tour combining major sights with a truly gastronomic experience of Italian wines and cheese. Explore the top sights of the motherland of the Renaissance, Florence, visit San Gimignano and Siena and stay in a hotel set in a former post office from the 15th century. Taste noble Italian wines Montalcino and Montepulciano, visit Tuscany wineries, cellars, and vineyards and sample delicious Pecorino di Pienza cheese. Welcome to Florence! Upon arrival, you are met by your private driver at the airport, who transfers you to the hotel for check-in. In the morning you check-out from the hotel in Florence and your private driver takes you on a sightseeing tour to visit San Gimignano and Siena. In the morning you are picked up from the hotel by your private driver and taken to the first destination - San Gimignano where you have some free time for independent sightseeing. Often called the town of towers as it is home to 14 well-preserved towers from the medieval times. These towers vary in height and form the international identity of the town. San Gimignano boasts many churches, such as the Collegiata and the Sant'Agostino. Moreover, the heart of the town contains 4 Piazzas - Cisterna, Duomo, Pecori and Erbe. Then you continue to Siena, Italy's loveliest medieval city. During the tour with a local guide, you visit all of the major sights including the Cathedral of the Duomo, which houses the works of artists like Nicola Pisano, Ghirlandaio, Ghiberti, Donatello and Jacopo della Quercia. You then see the Piazza del Campo - a shell-shaped structure, which is also a major attraction famous for hosting horse races. After both tours, you are transferred to the amazingly beautiful hotel set in a former post office from the 15th century. Upon arrival, you check in the 4-star Hotel Osteria Dell'Orcia, located in the UNESCO-protected Val d'Orcia Nature Reserve. In the evening you are transferred back to your hotel. Upon arrival, you have a cooking class in a local farm restaurant located just few kilometers outside of the village. Here you learn how to cook a traditional Italian meal and about Italian dining traditions. Your experience starts from picking spices and vegetables and collecting the eggs. After about 3 hours of the workshop, you enjoy a full Italian lunch which includes starters, home-made fresh pasta with sauce, the main course and a dessert. Following breakfast, you check-out from the hotel and your private driver transfers you to Florence. Upon arrival, you check-in and have a choice to either have a free day or join one of our carefully-planned optional tours. In the morning you have a gastronomic tour with a chef. You visit the best gastronomic shops in the historic center where you taste Prosciutto, Tuscan cured meats and Parmigiano Reggiano. Then you visit the best cheese shop where you taste Italian cheeses (sheep, goat and cow). Then onto a superb artisan chocolate shop, the owner and master buys the best cocoa beans and produces his own excellent chocolate. Your next stop is one of the most historic delicatessens in the city, which still represents a classic meeting place for Florentines as well as the preferred destination for lovers of specialties made with truffles. You taste the famous sandwich with truffle paste. Your afternoon gastronomic tour ends at the well known historic Enoteca (wine shop) where you have wine and olive oil tasting. Time at leisure in the afternoon. Overnight in Florence. Your truffle-hunting day starts early in the morning. Your local, professional truffle hunter and English interpreter (accompanied of course by the truffle dog) meets you in the morning and accompanies you on silent paths through the crisp, misty morning. You look for, listen, and learn, and in the end, you will almost certainly find the precious tuber, a moment of great excitement. Then move onwards to the farm and wine cellar for a tasting of local products and a guided sensory analysis of the black and white truffle. Lunch at the farm is available upon request at an extra charge depending on which type of truffle is featured in your meal. After the tour, you are transferred back to the hotel in Florence. This is the last day of your Tuscany exploration. 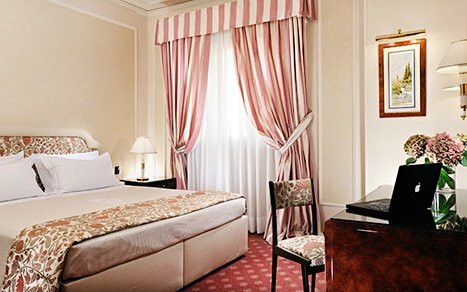 Today you check-out from the hotel in Florence and your driver transfers you to the airport for your flight back home. We wish you a safe flight and hope to work on your future vacations! Recommended extension: If you would like to extend your Italian vacation, continue exploring its wonders with our extensions, please, contact your specialist for details.